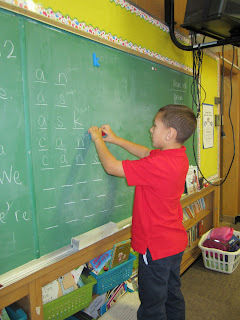 I want to tell you today about a sweet activity I do once a week (on Fridays) in my classroom - Making Words! 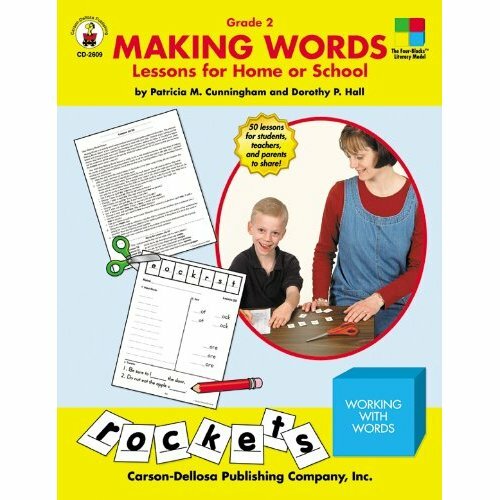 I first learned about Making Words when I was doing a clinical in a third grade classroom. My cooperating teacher did the activity once a week and I really loved it so I decided to do it in my own classroom! If you aren't familiar with this situation, here is the scoop. Every student gets a worksheet with 5-6 letters on the top of it in boxes. They cut out the boxes and then I call out words for them to make with their letters! Typically, each week has one or two word families that they're working with. This week I think it was -an and -ack maybe? Anyway, as you can see in the picture, the words start easy - "an", for example. As you move on, they get a little more complicated - beginning blends, digraphs, what have you. I love this activity for several reasons, and here they are! It gives all of my students a chance to practice decoding, encoding, and reading skills in a low-stress environment. Their affective filter is low, so to speak, because they are doing the activity in a large group and can lean toward a friend if they need a little help. The kids LOVE coming in the front of the room to make the words. As you can see in the picture, I have magnetic letters that I use to have the kids demonstrate the correct spelling. It is great for kinesthetic learners! They get to manipulate the letters on their desks AND on the board if they get called up! It hits visual and auditory as well - the visual learners SEE the letter magnets on the board, and the auditory learners HEAR us spell it together out loud! It touches on vocabulary if they give you some weird words to make! I bought a book to just print the pages out of. Here is what I have (except I have the first grade version...). You can also make your own letters and lists of words if you are focusing on a specific word family or spelling pattern for the week. I have nothing to say, other than I'm back to blog reading! And as always your post makes me smile...denim jumper..."whateves"
I recently bought a making words book for second grade. It definitely has a more updated cover on the front. I am doing the first lesson tomorrow with the whole class. I think we'll do it that way for a bit until my kiddos are ready to do it at their seats. I would like to be able to post about how it's going sometime this week.